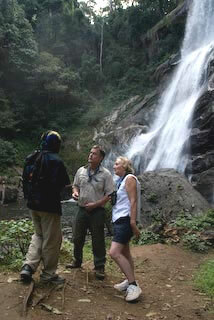 Pack some sturdy shoes, as a trek up to Sanje Waterfall is no 'walk in the park'. Breathtaking, overwhelming views will greet those who make the effort to reach the top of this the 'piece d' resistance' of Udzungwa National Park. There are no roads inside the park, but there are plenty of walks of varying length and difficulty to explore beneath the canopy rainforest and cascading mountain streams.